The classic elegance of natural Portuguese limestone holds great appeal for people seeking fashionable fireplaces and mantles. 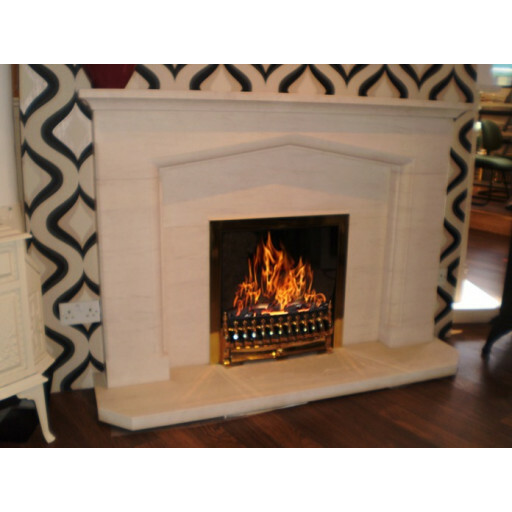 The Fireplace Warehouse proudly offers one of the most charming and trendy stone fireplaces. The Tudor 60 Limestone Fireplace. Its classic cream-coloured texture and sleek lines complement virtually any interior design scheme. Created from the finest materials, this fireplace offers a prominent straight mantle and base, and a central square hearth opening. It includes two thick carved side columns and a gently curved Tudor-style central arch. They set off a slightly recessed stone interior surrounding the flame bed. This impressive fireplace would make a wonderful addition to a business or a residence this year! In addition to its solid construction and remarkable beauty, if supplies the timeless allure of lustrous natural Portuguese limestone, a desirable fashion accent connoting opulence and prosperity. The stone will reflect the warmth of a crackling fireplace very effectively. Consider using this lovely item to enhance a living room, a den or a dining room. Its surprisingly affordable price will please value-conscious shoppers. The stunning Tudor 60 Limestone Fireplace infuses an element of luxury into its surroundings. It makes a delightful addition to work and living spaces!